Want a close up peek of celestial bodies scattered throughout the sky? Then buy a telescope. There are a number of telescopes designed for hobbyists can causal users that do not cost an arm and a leg. Selecting an amateur telescope is not that hard. 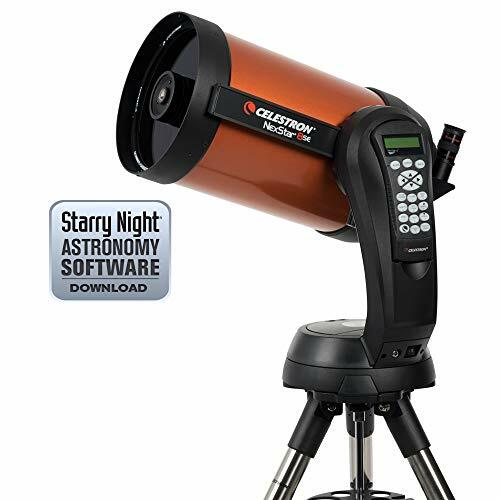 Celestron PowerSeeker is definitely one of the most popular telescopes today. It’s affordable to the average consumer, and it’s as powerful as a professional scientific telescope. This telescope is equipped with 3x Barlow lens. The top quality lenses are perfect for looking at celestial bodies with as much clarity as possible. The mount is German Equatorial and the aperture is 127mm. The telescope’s focal length is a respectable 1000mm. You will get this telescope with a valuable aluminum tripod and a tray to keep accessories. You can rely on detail when you are using this telescope. You can improve performance with the accessories provided. Plus, this telescope has slow motion controls so you can keep track of the movement of the stars easily. The telescope’s erect image optics make it possible to check out objects on the terrestrial sphere too. Overall, this telescope delivers excellent features for the price. It’s recommended for hobbyists, budding astronomers and scientists as well. This is a High-end telescope with an aperture of 5.1 inches reflector. It can gather maximum amount of light to give spectacular views of the Moon and other celestial bodies. On a clear day, you will be able to spot bright star clusters, galaxies and nebulas as well. The optical tube, at only 24 inches, is quite short. That design supports greater portability. Also, the short optical tube can generate faster f/5 focal ratio when you are looking at a wide field. Overall, this is one of the most versatile telescopes available to non-professional astronomers. The telescope comes with an EQ-2 equatorial mount, which is very sturdy and stable. You will also get an adjustable tripod. You can manually generate slow motion movement of the telescope to track celestial objects migrating through the night sky. The total weight of the telescope (without the mount or the tripod) is only 27 pounds. It’s lightweight enough for convenient transportation. Accessories provided with this telescope include two .25 inch Sirius Plossl eyepieces, collimation cap, tripod accessory tray, 6×30 finder scope, 1.25inch rack with pinion focuser and Starry Night astronomy software. 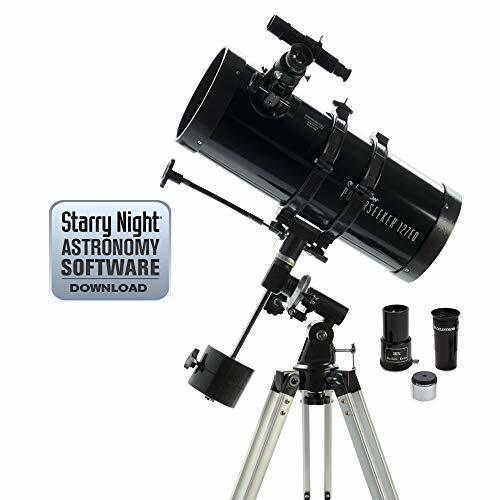 Includes two 1.25 inch Sirius Plossl eyepieces (25mm and 10mm), 6x30 finder scope, 1.25inch rack and pinion focuser, tripod accessory tray, collimation cap, Starry Night astronomy software, and more! 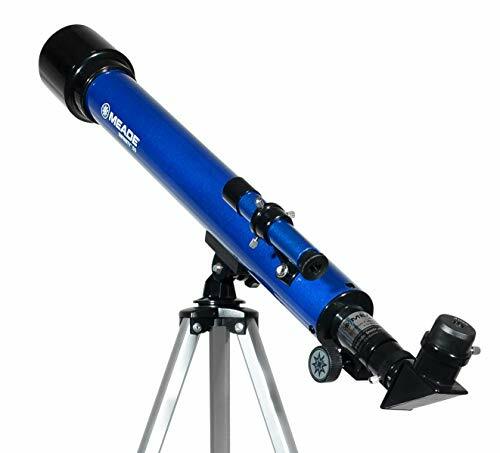 This is telescope has a gorgeous blue metallic exterior and comes with a sturdy and stable tripod for comfortable stargazing. The mount is Altazimuth so it makes pointing the telescope in the direction you want very easy. This telescope has lenses with 50mm aperture, focal length of 600mm and a focal ratio of f/12. A rack and pinion focuser is provided with each purchase. Impressively enough, the magnification lenses can be adjusted to support a variety of viewing positions. The Barlow lenses inside can double the magnifying power of each eyepiece. This telescope also has a 5×24 optical viewfinder. It’s a support system that helps you point at the celestial bodies you want to observe. A host of accessories are provided with a convenient holding tray to use when you are observing. This telescope is packed with features that the whole family can benefit from. It delivers excellent value for the price tag. Also, the package includes astronomical software and an instructions DVD on how to properly use the telescope. NexStar 8 SE is a robust telescope that amateur or experienced astronomers can appreciate alike. The features on this telescope are all top notch. It comes with an 8-inch Schmidt-Cassegrain aperture. The telescope is covered high transmission coating, which delivers optimal optical performance even if the observational environment is poor. The telescope is equipped with a StarPointer finderscope. It’s a neat device that can help you align the telescope accurately for locating moving celestial objects. Even more impressively, the maximum magnification level is 480x (the lowest is 29x). The focal length of this telescope is a whopping 2032mm. This telescope is optimized to be very easy to use. It has a quick-release form arm mount and you don’t need any tools to set up the optical tube and the accessory tray. There’s a feature called SkyAlign, which assists you to align the telescope with any three bright celestial bodies. The alignment process of this telescope is therefore far superior to any other. Plus, the telescope is provided with a database of almost 40,000 celestial objects that the user can define. Information is provided for over 200 objects. 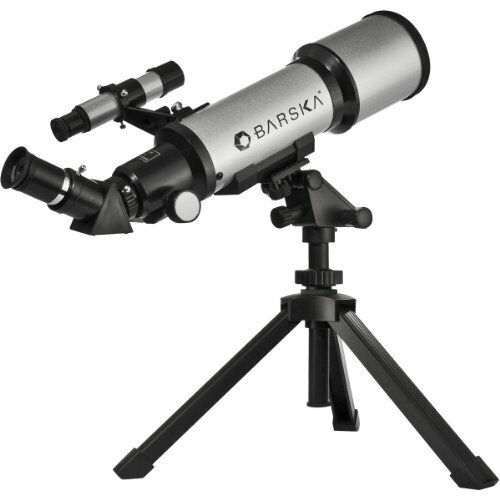 This is a highly affordable entry-level telescope intended for students, hobbyists and families who would like to have a telescope on the balcony. Even though this is intended for casual use, the telescope has a magnifying power of up to 300x. Focal length is 400mm, which is quite respectable for the low price. The telescope lenses are coated to enhance brightness of images being observed. The eyepieces are equipped with 3x Barlow lenses that are quite versatile. This telescope is very easy to use. A child over 12 will have no trouble using this device. The tripod is adjustable and a small carrying case is provided for convenient transportation.The telescope comes with Deepsky Astronomy software programs for beginners. Even if it is intended for beginners, experienced hobbyists will find excellent use for it too. If you purchase this telescope new, you will receive a limited lifetime warranty. Conclusion: When buying a telescope, make sure you are choosing a reliable brand. The manufacturer must provide some sort of a warranty as well. Telescopes require expert knowledge to fix so only the manufacturer will know how. Purchase a telescope that comes with additional accessories and software to enjoy a truly amazing experience from your balcony or rooftop.